This is probably the most memorable of the novels I studied at postgraduate level. It is the most well executed example I know of a book where almost all of the action takes place underneath the surface. At first reading it’s banal, but every line crackles with significance. Mr Stevens, the butler of Darlington Hall, takes a brief motoring holiday through the Home Counties. He narrates as though speaking to a fellow professional of the time, and assumes that you share his knowledge and general opinions: ‘How often have you known it…’ ‘You will understand…’ ‘You will not dispute, I presume…’ It could be a monograph for the Hayes Society, that society of butlers with which Stevens is in such intellectual conflict. Long chunks of the narrative are filled with Stevens’s opinions on aspects of his profession, such as the importance of good silver polishing, the best way of serving at table when only two diners are present; and most of all, what makes a great butler. This could potentially make for a very boring read, and my tutor Michael Schmidt said that Stevens is a very dull narrator. I disagree. Stevens is not a dull narrator. His pedantry and preconceptions lead to many light moments, some laugh-out-loud funny (as when he considers escaping the attentions of Miss Kenton by climbing out of the French windows) others more subtle. It would be so easy, though, for Stevens to have become a stock comic butler, but Ishiguro ensures that he never does. He gives the butler many human touches: Stevens enjoys the odd pint of beer or cider, and likes trashy novels as well as travelogues of the English countryside. It’s these little details that make him more real, and give his story the power to move us. Another way in which Stevens differs from stereotype is his attitude towards his profession. Right at the beginning, he tells us that ‘there is no virtue at all in clinging as some do to tradition merely for its own sake.’ Stevens sees himself as a moderniser. His father’s generation viewed the world as a ladder, with the great aristocratic families at the top; one’s objective as a butler should be to work for the richest, most powerful family in the land, getting as high up the ziggurat as one can. A running joke throughout The Remains of the Day is Stevens’s attempts to come to terms with the new phenomenon of ‘bantering’. Accustomed to treating his superiors with politeness, Stevens has to reconsider when the landlord of his local tells him that ‘were he an American bartender, he would not be chatting to us in that friendly, but ever-courteous manner of his, but instead would be assaulting us with crude references to our vices and failings, calling us drunks and all manner of such names, in order to fulfill the role expected of him by his customers.’ Stevens tries many times to formulate a ‘bantering remark’ only to be met with confusion. The joke will come to have a poignant significance, as you’ll see. He motors out into a world that has undergone profound changes since Stevens’s heyday at Darlington Hall. Stevens himself, with his cast-off suits and his flawless Queen’s English, stands out in the provincial south, whose locals react to him with reverence and bemusement. Although Stevens is vocal and prolix about his thirty-year service to Lord Darlington in his narrative, he is cagey when people ask him about the man. It’s clear that Darlington is one of many aristocrats whose reputation was blackened by the war. Stevens, in his prose, acts like a harrassed spokesman for a dodgy multinational on this subject: but his repeated justifications, both of Darlington and his long service to the lord, can’t obscure the fact that Darlington was at best a fool and at worst a sympathiser of Nazism. Darlington is at the hub of the wheel: but he is turning it backwards. Not all of Stevens’s ideas are wrong, there is something that separates the gentleman from the mere human male. But writers studying the will to dominate must also understand the will to submit. It’s not only guns and secret police that keep the dictatorship in power. It’s something that gives us the glow we get from doing even the lowliest professional job for the most corrupt company. 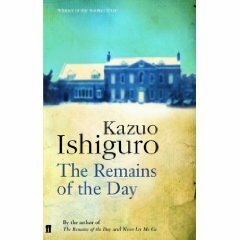 It’s the tragedy of The Remains of the Day that Stevens gives in entirely to this instinct for submission – at the expense of far more important things. Stevens continually dismisses the prospect of a relationship with his housekeeper, Miss Kenton. There’s a very moving scene where Stevens and Kenton discuss the case of a couple of staff who have run away from Darlington Hall to get married. Speaking of the errant maid, Miss Kenton says: ‘So many young women like her throw away their chances, and for what?’ The parallel with Stevens is clear: he’s committed the much more dubious choice of throwing away his and Miss Kenton’s chance of love for the sake of his career. When, at the end of the book, Miss Kenton wonders aloud what kind of ‘life I might have had with you, Mr Stevens’ it causes Stevens to finally make explicit what has always been under the surface: ‘Indeed – and why should I not admit it? – at that moment, my heart was breaking.’ Michael Schmidt compares this moment to that in Austen’s Emma when Emma Woodhouse realises that she has sacrificed her happiness for other people’s. The final blow for Stevens comes with his encounter with Harry Smith, a democratic socialist who challenges the butler’s idea of dignity: ‘If Hitler had had things his way, we’d just be slaves now. The whole world would be a few masters and millions upon millions of slaves. And I don’t need to remind anyone here, there’s no dignity to be had in being a slave.’ Later, discussing Lord Darlington with an outsider for the first time, Stevens says of his old master that at least he made his own mistakes: ‘I can’t even say I made my own mistakes. Really – one has to ask oneself – what dignity is there in that?’ In this moment of despair, you nevertheless get the sense that Stevens has learned something: it’s too late of course, but perhaps late is always better than never. This entry was posted on December 2, 2009 at 9:26 pm and is filed under Classic Books, Fiction. You can follow any responses to this entry through the RSS 2.0 feed. You can leave a response, or trackback from your own site.